Without going full-on Earth Mama in this post, I’ll say that consumer culture isn’t the best thing for our land. Throwing a shirt away for one rip or hole (especially if it’s play clothes) is a waste. 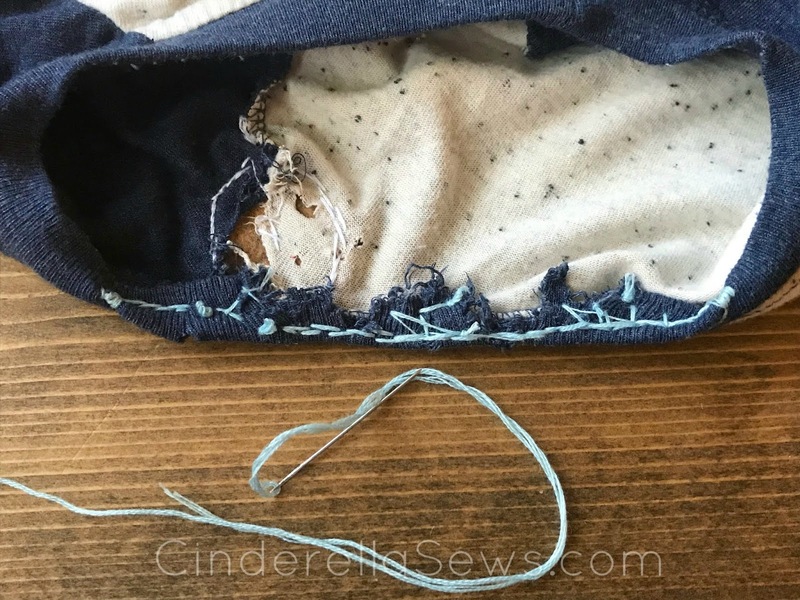 For things like backpacks and work clothes, trying to re-sew over a ripped seam is the best way to hide a mend, but what if you want the mend to stand out and be a piece of art on your shoulder? I give you Pete the Cat. This photo I posted on Instagram a few days ago had quite a response to it, which gave me the idea for this article! As I shared on Instagram, my son and I are both on the autism spectrum (I talk more about it in this post and was published on Scary Mommy with this post I wrote for my Urban Homesteading Blog). This means we both STIM when we have anxiety or pent-up energy. Stimming is short for “self-stimulatory behavior” that usually presents as repetitive sensory-input movements. More destructive ones like head banging or finger-biting are discouraged in kids for obvious reasons, but replacing them with more positive behaviors (like rubbing hands, spinning rings on your fingers, bouncing a leg, tapping feet, etc) is much better than trying to get rid of them all together. Doing so really makes anxiety and emotional stress worse (leading to stomach aches, crying, etc). One of my son’s big STIMs has always been chewing. He started biting his nails and fingers when he was 18 months old—long before we knew either of us were on the spectrum. Being a life-long anxiety sufferer, I immediately recognized why he was doing this. He was chewing to the point of his fingers bleeding and chewing through the wooden slats on his crib. We began giving him big, peeled carrots every time we saw him chew and it really helped him stop hurting himself (although he kept chewing his bed slats until he moved out of the crib 😅). That stim was easily transferred to chewy and crunchy foods for most of his toddler years, but recently he started chewing holes in his shirts. Mostly the collars and occasionally the shoulders. Of course I offer foods when I see him doing this, but sometimes he does it at school or in the car. He has literally chewed some kind of mark in 90% of his shirts. Mama is to the rescue with her sewing kit! 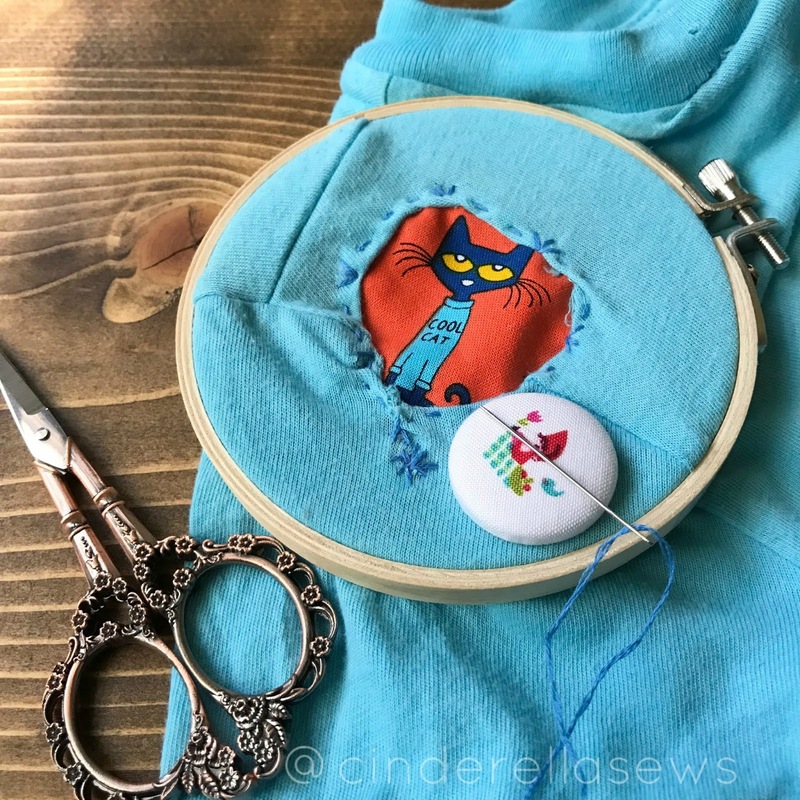 Adding color contrasting patches (like this awesome Pete The Cat fabric ) with some cool embroidery stitches is a bright and fun way to fix holes. Simply roll the shirt fabric under to protect from further fraying and stitch away. Embroidery hoops really help keep the tension, so I always recommend using one. Simple stitches, like whip stitches, are good for mending tiny holes. Using a contracting color will show off your bohemian side. 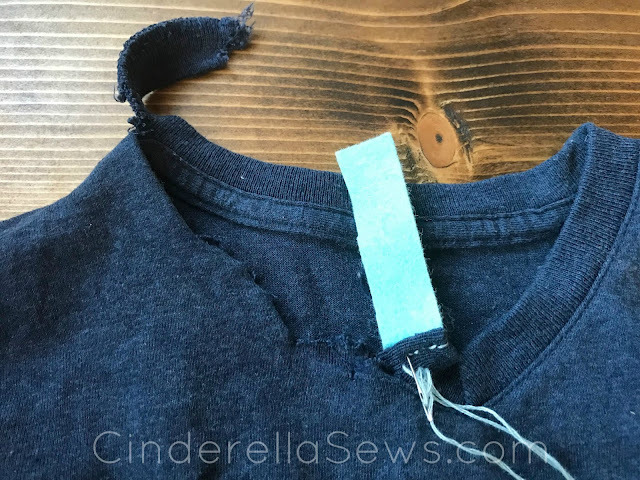 For frayed collars, trim any excess, fold under, and use a blanket stitch. Usually reserved for felt softies and ornaments, blanket stitch is decorative and will help keep that fray under control. Another option is to cut a piece of non-fraying wool felt and replace a missing portion of collar or cuff. Sometimes if there are a lot of little holes, or if the problem area is along a seam, a patch on top of the area is more sturdy and attractive than the peeking patch. I stuck with the theme of this football shirt and added a wool felt patch with back stitches (it MUST be actual wool felt and not acrylic felt—which will fall apart soon after the mend). Wool felt won’t fray and it will add some depth to your mend. To make a mend stand out, really go for the embroidery work! Spirals, stars, layering, leaves, flowers, beadwork, running stitches—anything to make your project fun! 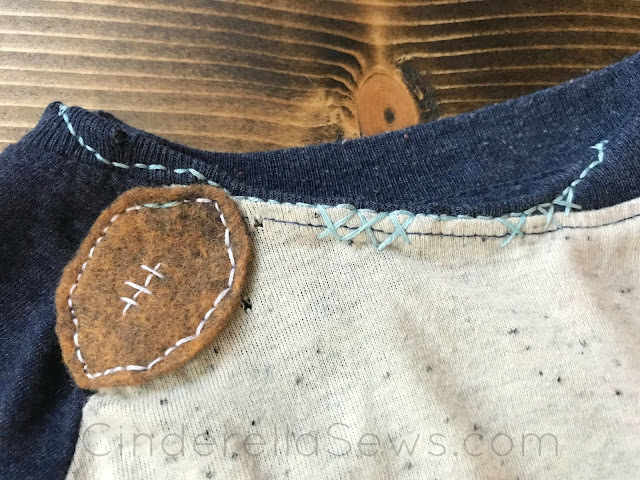 Mending is one of my favorite creativity boosters! When I’m stuck on a pattern or structured project, a little mending helps me cleanse my proverbial stitching palette and work through the issue. My son now has one-of-a-kind clothes! He particularly loves Pete the Cat riding on his shoulder! 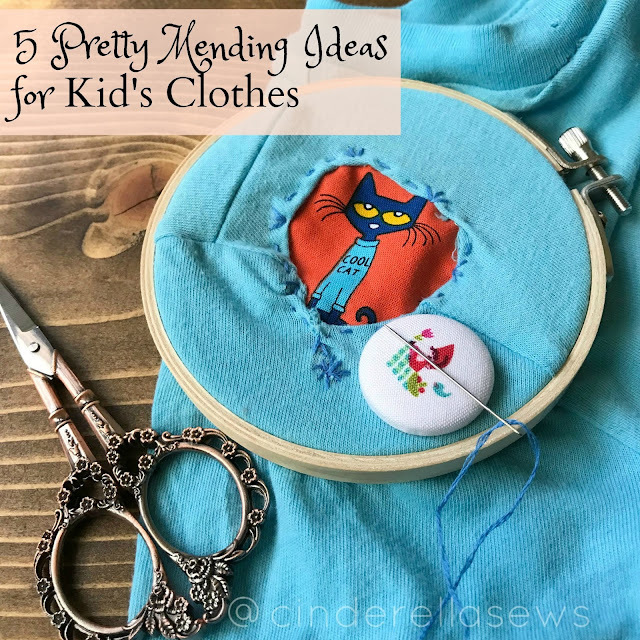 For more ideas, follow the #makedoandmend hashtag on Instagram or check out the books Mending Matters: Stitch, Patch, and Repair Your Favorite Denim & More by Katrina Rodabaugh or Visible Mending: Artful Stitchery to Repair and Refresh Your Favorite Things by Jenny Cardon. If you mend something, please tag me @cinderellasews on Instagram, so I can see your handiwork and if you’d like more free tutorials, you can sign up for my semi-frequent newsletter!